Season 2 of Westworld HBO series is over now. I’ve enjoyed the first season a bit more than the second, yet each episode rewarded me with self-reflection. The thing is, that the whole series made me wondering about the future of testing and challenges ahead. I’ve shared these thoughts with Anna Royzman during Test Leadership Congress 2018 in New York and decided to share my idea with other attendees during an interactive session. So buckle up, and let’s go to the future! Do not worry, this posts contains no spoilers of Westworld series. Westworld was created by Delos company. It is a future theme park with a hands-on role-playing experience filled with artificially created beings for human guests. Artificial beings (Hosts) – Manufactured by 3D printing from reusable materials. They are programmed to act on their storyline in the park – including interacting with each other and with guests. Their code prevents them from hurting any non-host human. Environment – Huge terrain filled with in-theme items. Multiple cities and settlements imitating Wild West. Transportation on foot, by train, horseback or by carriage. Multiple props for guest (and hosts) using – including guns and liquor. Guests – humans paying for their stay in the park. They might, but do not need to follow a storyline. During their stay in the park, they may act as they want including using, harming or destroying hosts. Park goal – The strategic goal is making money by entertainment – this includes thorough monitoring, fixing and re-using hosts, creating new stories, opening new parts of the park, making hosts more live like… Add politics (there is always some politics), patent and regulations, and maybe not-that official side projects run by employees. Delos company – Huge and diverse, with many roles including owners/directors, sales and marketing department, environment department, behaviour department, narrative department, technical department, livestock department, security department and quality department. What are the challenges Your co-workers are facing? After some time of discussion and notes taking we progressed to sharing our ideas. To not repeat ourselves after the first group the next added more challenges they found out as it was impossible to follow this same trail in every group during this short time. When I think about it there is no surprise there. When human lives are at stake security comes first. Especially when next to their health their privacy might be threatened as well. And then the harder testing gets the more important testability to become. I think whenever we feel the project might be hard from a testing point of view we should pay much more attention to those aspects. Of course, in most cases we want our projects or products to be sustainable and maintainable, so it is important to ask the question “what next? what after this first release?”. Psychological aspects – How often You consider well being of Your fellow testers in a complex project? Do You react with help for the first signs of something bad happening or You just escalate this as a problem? So many questions here! Weather and environmental impact – Are our servers secure? In case of storm and blackout do we have a backup or at least error page? Do we consider timezones? Legal – Are things we develop in line with rules and regulations? Not only of our country but the countries it will be used in. Do we have legal rights to do what we do, e.g. access to some data during our tests? My reflection is that I would love to continue with this workshop to enhance and expand this mind map. I am very grateful for such place like Test Leadership Congress – it was a perfect place to run this workshop for the first time. All attendants were really engaged in the discussion, which not always happen from my experience. It also proved to me that some problems require not only a large number of people but the diversified group as well. I’m old enough to remember the original ‘Westworld’ film (and actually haven’t seen any of the current series). 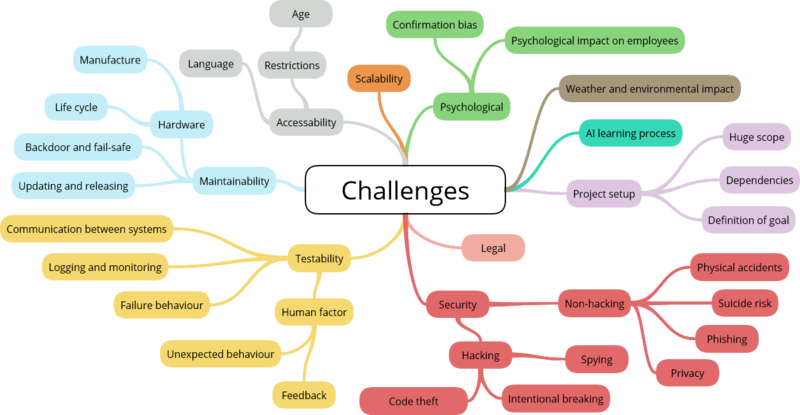 Now, the 1970s version wasn’t created in any context of detailed knowledge about systems design and development; but as I recollect, the issues over customer safety and systems failure were centred on a) the underlying AI systems exceeding any limits on their learning, growth and development, leading to unintended robot actions; coupled with b) possibly unrelated infrastructure systems failures. A lot of this in the original film was plot-driven – that is, bad stuff happened in the film because the plot demanded that bad stuff happens. The script was never written with the intent of simulating “real” (for any given value of ‘real’!) software failure situations. Still, the whole situation does expose something that I’m increasingly noticing; that there are complex systems in the Real World where failure is not necessarily down to any one software bug or design failure; rather failures result from complex interactions between different systems where one minor failure in system A combines with a similar minor failure in system B to result in a disproportionately severe failure in the output from system C.
And trapping that sort of issue will need much more testing than many companies will be willing to put in place – at least, not until some senior executives end up in jail because a complex series of interactions between systems with various failures of various levels of severity all combine in unlikely ways to result in loss of customer life. Only then will end-to-end global system testing become a Thing. And that’s when testing will at last become a fully fledged, professionally recognised, global status occupation, with senior testers on the Boards of global corporations.